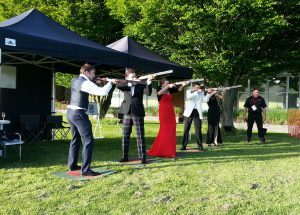 We specifically configure laser clay shooting for you, your clients/guests and friends to get the most out of our time with you at your wedding, corporate day or event. There are many options with 4 different scoring modes so the game can be configured in a number of different ways with various difficulty levels depending on experience. 'Going away birds' ~ where the clay flys from behind the shooter flying away in front. 'Crossing birds' ~ where the clay flys across the front of the shooter, either left to right or right to left. 'Over the top birds' ~ where the birds fly at the shooter going overhead. There really is nothing to be afraid of and with patience we can useally get everyone to hit something. Generally we start with instruction on how to hold the gun, then move on to how to aim before practicing on a static clay target. Then when you see how easy it is, a couple of practice clays in the air and on to the game. Starting with a going away bird with both shots being able to score, the first worth 2 points and the second 1 point, so 3 points per clay. We class a round as 15 clays with a maximum score of 45 points. So far less than 20 people have ever scored 45, will you be the next? Once you improve it's on to the Speed Shoot, where it becomes very competitive, the first to hit the clay scores 5 points the next shot that hits scores 4 points and so on down to 1 point. We record all the scores so you can see how everyone is doing. The size required for the system to operate is 40m x 10m which allows for a controlled launch and land of clays. 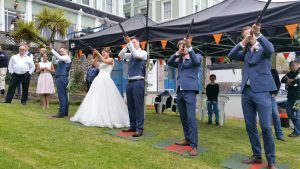 Here at Clayzer we only do laser clay pigeon shooting and by configuring laser clay shooting just for you and your guests we pride ouselves in being able to give you the best experience ever! Laser clay pigeon shooting can be enjoyed by people of all ages. As long as you can hold the gun and aim it then you can take part. It can be played just for fun, or as a serious competition with people participating as individuals or as part of a team. As with any sport, there are different levels and classes enabling it to be played by everyone. Laser clay pigeon shooting is the only shooting sport you can enjoy knowing that there is absolutely no harm to the environment. CLAYZER guns fire a harmless infra-red beam at re-usable clays - and even the sound is totally controllable. So no mess or risk of damage to your surroundings. Not only is laser clay pigeon shooting environmentally safe, but as the guns are deactivated there is no danger to participants or spectators and even young children can play CLAYZER in total safety. · Environmentally friendly clay pigeon shooting (no broken clays or pellets & wadding). · Suitable for all ages from 10 years up. · No noise or kick-back (recoil). · Suitable for any location: Golf Clubs, Hotels, Conference Centres, Wedding venues and private dwellings. 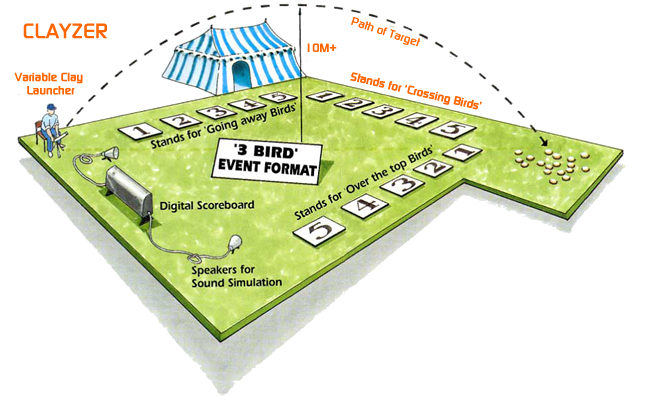 · Multiple users can participate at the same time (up to 5 at a time) encouraging a fun event. · Immediate scoring for all shooters, and audience, to view on the electronic scoreboard. · Five different scoring games available to increase the level enjoyment and /or competition. · De-activated shotguns eliminate any gun recoil and eliminate sore shoulders for shooters. · Totally safe and risk free.